during a 700-mile leg of the Great Loop. The wind was blowing 30 knots, 35 knots, then at least 40 knots, right on the nose. The waves were kicking up, building a nasty chop from two feet to three feet and growing. This had stopped being fun about 15 minutes earlier. The odd thing was, we were not in the middle of Lake Michigan, as we had been a few days before and where such conditions keep cruisers tuned in to the weather; instead, we were heading down the Illinois River, just east of Peoria. Yes, Peoria, as in the middle of Middle America, halfway between Chicago and St. Louis. 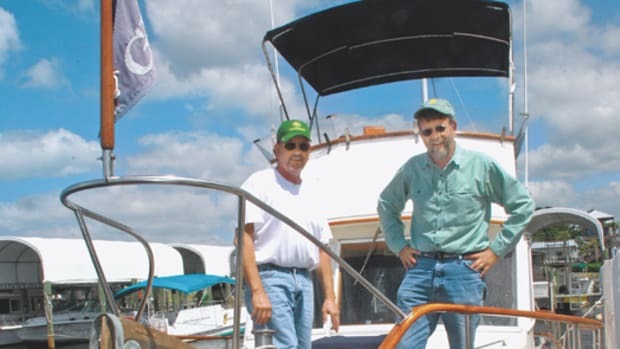 And, as my cruising partner George Sass Sr. and I found in Peoria, the old adage is true: No matter how well you plan, no matter how well you prepare, once you’re on the water, things change, and they can change quickly. Indeed, the day before, an early-summer Sunday, this same river had been calm and peaceful, a well-defined, tree-lined waterway filled with Jet Skis and bowriders, families and kids and dogs, and hundreds of people enjoying freshwater inland boating. As a result, well into our second week on board The Greatest Loop, a new Beneteau 34 Swift Trawler, we had lapsed into a false sense of security. Our bouncing around as we approached Peoria changed all that. Our Midwest voyage was part of the Great Loop, a 6,000-or-so-mile circumnavigation of the eastern half of the United States. This particular loop started in Annapolis, the headquarters of Beneteau Powerboats in North America (and of Annapolis Yacht Sales, its local dealer); the route then took the boat up to New York, the Hudson, the Erie Canal, up through the Great Lakes, down to Chicago, the Illinois and Mississippi Rivers to the Gulf of Mexico, around Florida and back up the east coast to Annapolis again. Sass had done the entire loop about ten years before on his own boat; he was anxious to revisit some of his favorite spots along the Michigan shore. I have cruised extensively on both coasts, but this was all new ground for me. 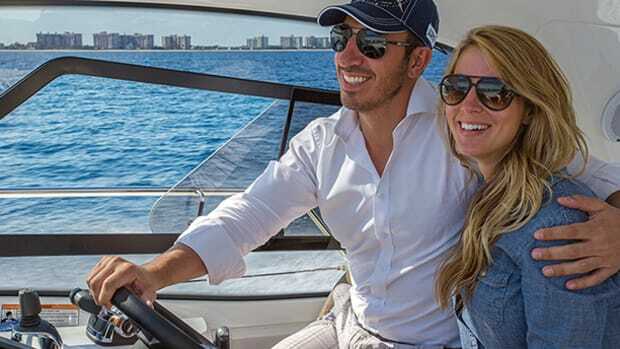 This entire venture started back at the Newport International Boat Show last September when I had lunch with Laurent Fabre, the VP of sales and marketing for Beneteau Powerboats in North America. Beneteau, the century-old French builder, is the leading manufacturer of 30-foot-plus sailboats in the world. 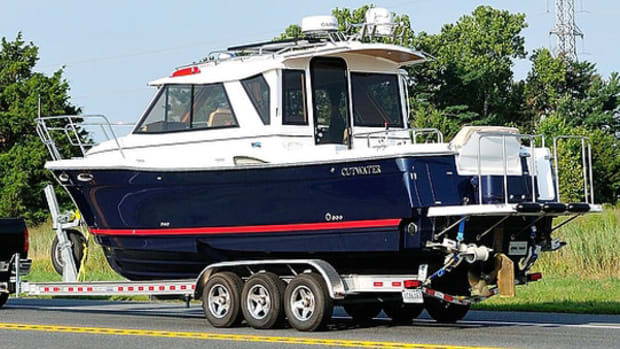 It now is also making powerboats and, according to Fabre, looking for exposure in the U.S. for its line of Swift Trawlers (measuring 34, 44, and 52 feet). I was looking for a good story. Be careful what you wish for. 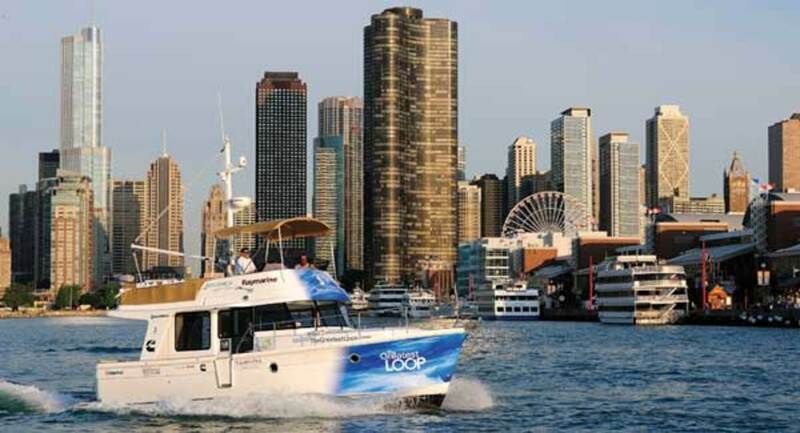 Power & Motoryacht’s leg stretched from the top of Lake Michigan down to Chicago, past Peoria to the Mississippi and then down to Hoppie’s, a riverside marina 20 miles below St. Louis. As a result, Sass and I climbed on the boat one Sunday evening at the end of probably the longest dock I’ve ever seen. It was at Bay Harbor Lake Marina, about two miles west of Petoskey, on Little Traverse Bay, Michigan, an area filled with wonderful old summer homes (around the bay) and new developments and condos (where we were). Even at the far end of the dock, it was easy for us to spot the boat; she had so many sponsor stickers that she looked like a NASCAR entry. Under the stickers, however, lay an appealing vessel. 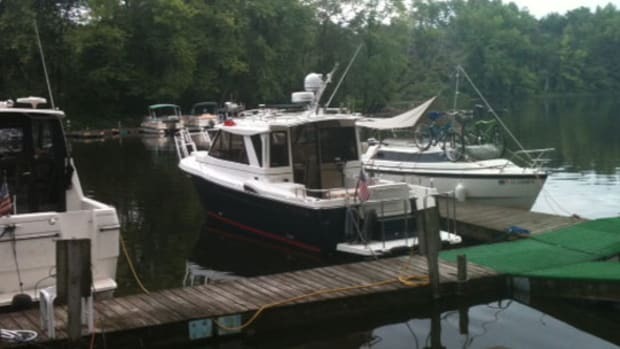 Built for cruising with a couple or small family, the boat has a generous master and a small guest stateroom (with over and under berths), and a large head (more than large enough for me, and I’m almost 6 feet 2 inches tall). On the main deck, there’s a user-friendly helm station, a galley, a saloon (equipped with a sofa bed that can sleep two adults), and, of course, a comfortable cockpit, all on the same level. 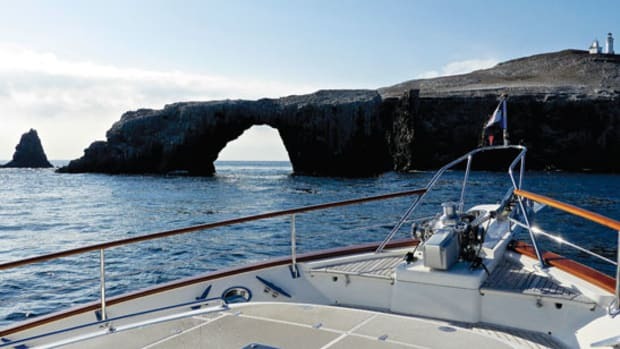 In addition to these arrangements, there’s a flying bridge, high bulwarks, a gently flared bow, and French-designed contemporary-trawler lines. Under the water is a slippery hull that a single, fuel-sipping 425-hp Cummins diesel drives to a comfortable 16-knot cruising speed (and 20.4 knots flat out). All in all, an inviting package at a very reasonable price. After provisioning and a late dinner overlooking the marina, we settled into the boat, determined to get an early start the next day. Since we were new to the boat, the next morning we checked all the systems, the bilge, and the engine and transmission oil levels. The engine room is under the aft half of the saloon. To get to it we had to move the two directors chairs and the saloon table out to the cockpit, pull up the carpet and dive in. (Not a big deal but not something you want to do in an emergency in a seaway.) All was well. We soon discovered how maneuverable the boat is. Just using the wheel (five turns lock to lock) and the throttle, you can turn the boat about in its own length. Add the bow and stern thrusters, and you can walk her sideways. In short, the Swift Trawler is a joy to drive, and to dock. The other surprise, to me at least, was the color of the water, both in the bay and once we were out on Lake Michigan itself. It’s clear and ranges from a rich blue to a beautiful light-green hue reminiscent of the Bahamas. 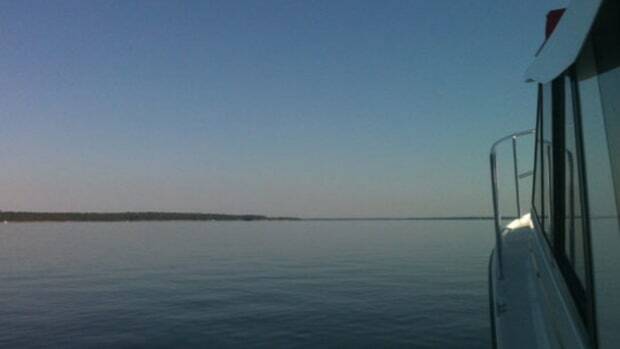 Looking at the water, and overwhelmed by the Midwestern good cheer and helpfulness of the people on the dock, I quickly understood why Sass wanted to come back to this part of the world. Soon our only concern was the schedule, not the boat. This was Monday; we had to be in Chicago by Thursday afternoon. As we knew, a schedule is the enemy of safe—and comfortable—cruising. And Lake Michigan is notoriously unpredictable, with the wind, generally from the west, sweeping across a 90-mile fetch in the afternoon, often building up ugly sea conditions that can keep cruisers huddled in ports on the eastern shore for days before things calm down. Still, we wanted to see as much of the fabled Michigan cruising venue, with its famous high sand dunes and long white beaches, as possible. By midafternoon, however, the weather turned sour; the temperature dropped at least 20 degrees, and the wind and waves were picking up. 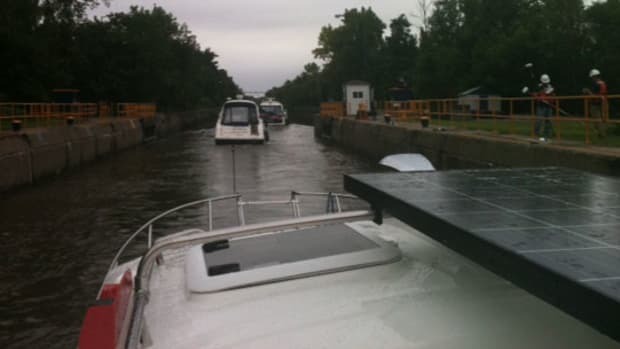 We headed into the small town of Leland through a tight channel made smaller by the presence of a dredge, and maneuvered into a dock in a 30-knot wind and light rain. The Leland Township Harbor marina was clean, with great facilities and friendly people, all attributes that were shared everywhere we stopped for the next ten days. Playing tourist, we walked about 50 yards up from the marina to Fish Town, a re-creation of the area’s fishing heritage with little shops, some old fishing boats, and a beautiful small waterfall. The quiet, inviting main street, another block inland, could have been painted by Norman Rockwell. The next morning our cruising pattern was set. 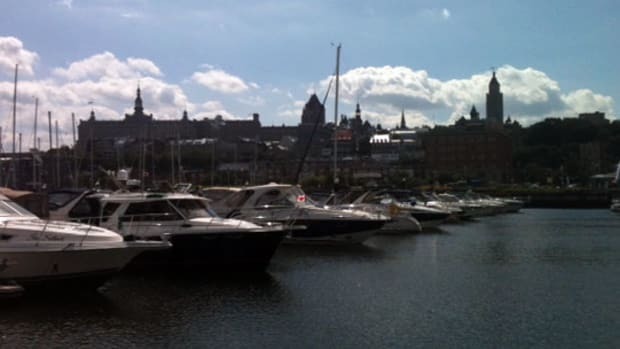 An early wakeup, usually about 5:30, coffee and a bite on the boat, showers at the marina, and off well before 7:00. The wind had picked up during the night, a mini-storm that produced a lot of bumps in the dark, requiring some fender checks, but we were off the dock about 6:30, listening to small-craft warnings on the VHF. We wanted to make Pentwater, about 100 miles away, so we pushed the boat to a 15- to 16-knot cruise through the Manitou Passage, leaving South Manitou Island offshore (it’s supposed to be beautiful, but a confirmation will require another trip), and running into a cold front with nasty 4-foot rollers in the afternoon. At one point the GPS registered 18 knots as we surfed down the back of one of those waves. Still, the boat was a pleasure to drive, even entering the Pentwater breakwater, a fairly narrow channel, in a following sea. This definitely got my attention; I was very glad we didn’t meet another boat exiting the breakwater. This article originally appeared in the September 2012 issue of Power & Motoryacht magazine.